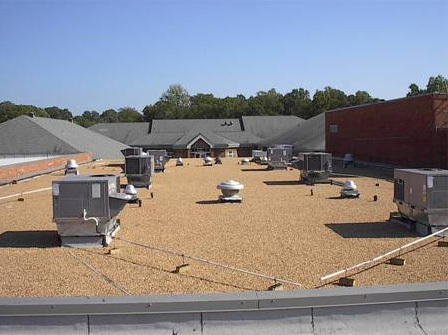 Built-Up Roofing (BUR) - Old Dominion Roofing & Construction, INC.
BUR roofing consists of several layers of roofing materials or single ply fiber glass and risen bonded together with hot asphalt or ballasted asphalt. The amount and types of materials used varies depending on specifications. A BUR roofing system is often referred to as tar and gravel roofs. BUR roofing offers protection from weather and UV light and are low maintenance. It is the most reliable and durable roofing systems for flat and low-slope built-up roofing. Old Dominion Roofing & Construction services uses a variety of roofing products offering our customers informed options based on time and budget needs.